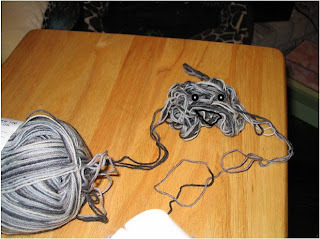 I'll bet by now you're wondering why I'm posting pics of "yarnblobs." Well, it has been my experience that every time I wind yarn from a pre-wound skein to a spool (cake? ), there's always a blob of yarn in the middle that plops out and has to be untangled before winding can continue. Every. Single. Time. So, I decided to start taking pictures of them and on posting them once a week. I figure I'll never run out of these pics unless Murphy's Law kicks in and suddenly my life becomes yarnblob free..... It could happen. After having decided to make a Fan Kimono with the pink Drops Alpaca Virginia Knitting sent me, I decided to go ahead and do some test swatches. First, I tried it with size US 13 needles in an attempt to get somewhere near the gauge in the pattern I want to use. That did not go well. At all. 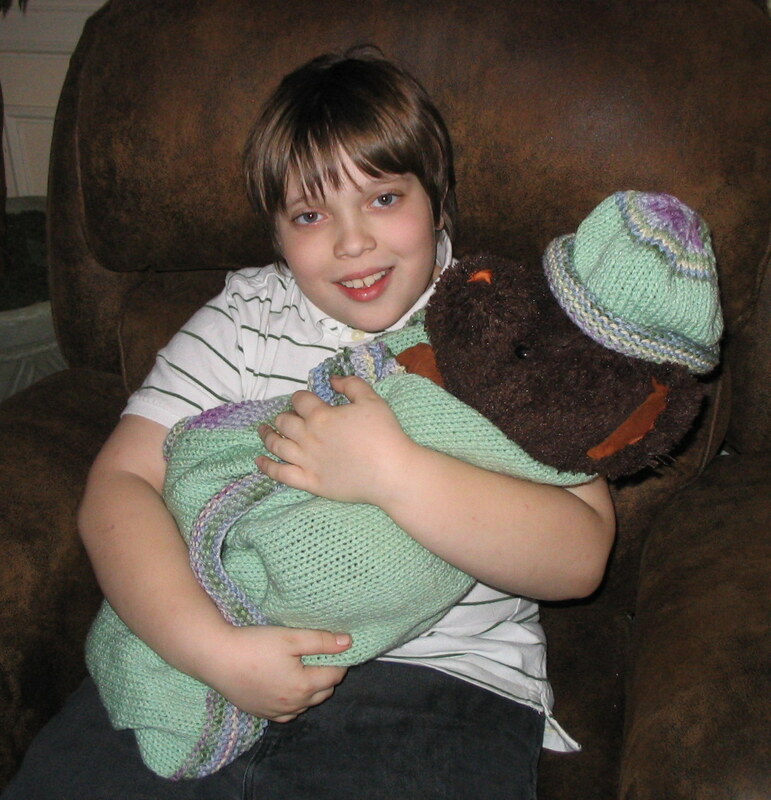 Seriously, it would have qualified for a Yarnblob post. Lo and behold, a shell pattern. 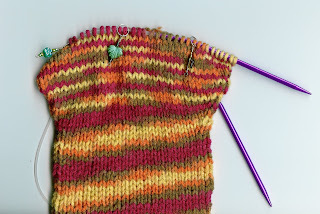 It seems the bigger the needles, the floppier this yarn looks. I think I'll go with the US 3's. It'll require some serious adjustment on the pattern, but the US 3's seem to tame this fuzzy pinkness better than the others. That, or I'll have to find a coordinating yarn to knit together with it. It's too late in the evening for my brain to function well enough to either look for a coordinating yarn or do any sort of accurate calculating, so I'll try tomorrow. I used parchment paper on the cookie pans so they just need to cool and be put away, already clean. Easy Button! After baking, I only managed to down one before I was all sugared out - they're very rich. Have I mentioned that I love my stand mixer? My Hubby likes to keep brown sugar in the freezer, so of course it gets lumpy. I just left the mixer on for a few minutes with the butter and sugar, and it got the lumps out. Easy Button! I made them some time ago, as you can see by the slow felting process that's going on during washing. I made these for myself, but despite my precise and numerous calculations, they ended up big enough for my Hubby. That was before I realized my in-the-round gauge is different than my back-and-forth gauge. Blast ye scurvy purls! 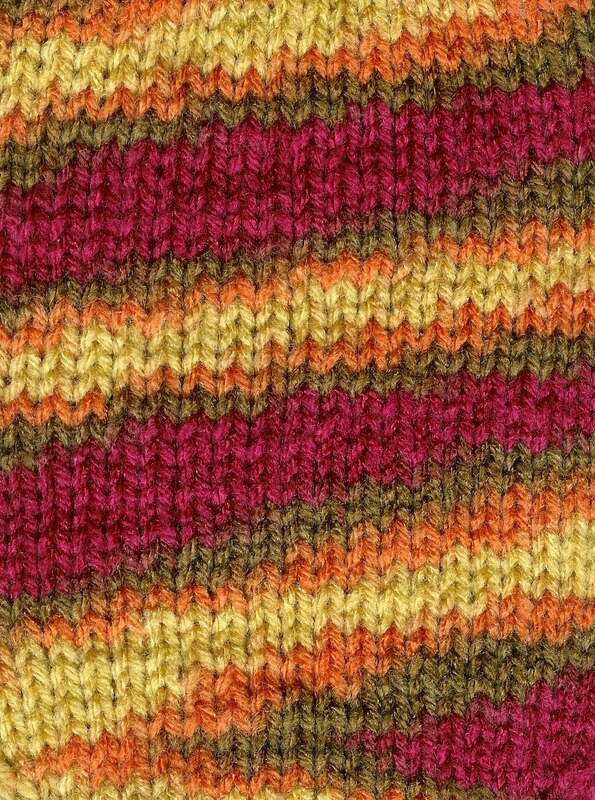 These days, I just knit them with a few quick calculations once I've got enough knitted to establish gauge. Easy button! Now that I've hit the easy button so many times in one evening, I'm too tired to knit. Oh well, off to bed; that's easy too. Probably another rough day at work tomorrow, but that doesn't hit the easy button, so I' not gonna think about that just now. Yes, that's a Wee Ninja. And yes, that's a fuzzy pencil with a tiny devil duck on either end, intended to be a two-ended weapon for the ninja. You just can't buy that kind of parental pride. Just a kudo to my Hubby because he always thinks about the little things, and that means a great deal. At first I sized these for myself, but it’s really not my color. Despite the bright pink, my Hubby likes the color, so I re-sized them for him. Now I can expect to see them quite frequently around the house, since we tend to wear the worsted-weight socks as slippers. 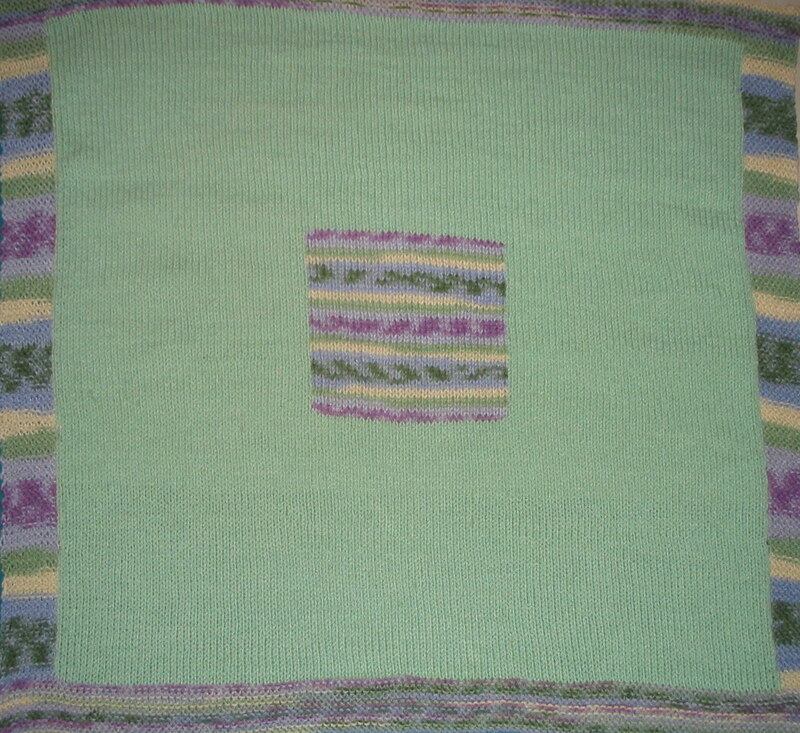 Once I’ve seen them around awhile, I can decide whether I like the color enough to make something bigger, like an afghan. Meanwhile, here’s the pattern. 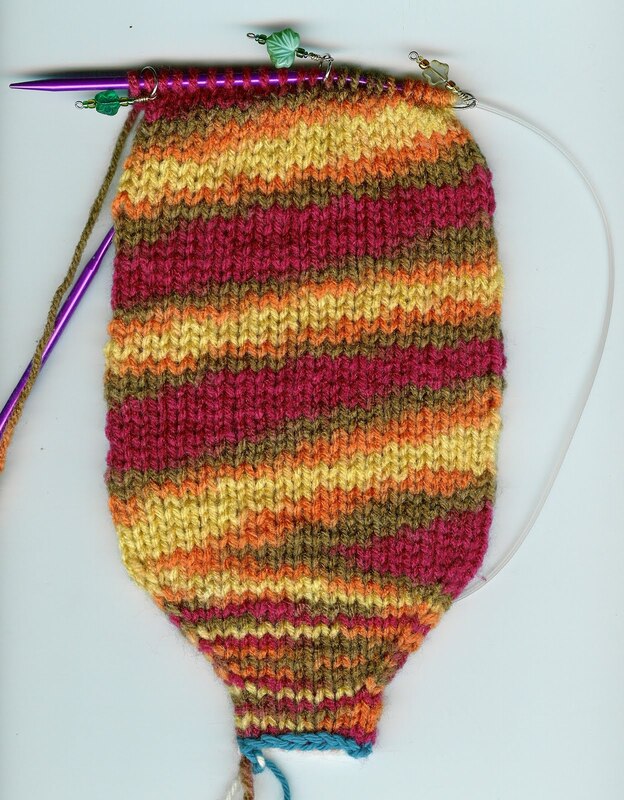 Once I get to the number of stitches I need and begin the heel decrease, I use the middle marker as my counter for the first decrease and turn (which is generally the middle stitch plus 2). Once I’ve done that, all the stitch markers come out, though the middle one can be left in to mark the center of the back row for bind-off purposes. Now, off to a late lunch with my Hubby, who has chosen to wear the new socks today. Guess I'll take the cabled scarf with me to work on. Well I basically did no knitting at all last night. I did some yesterday at lunch on some very brightly colored socks, but I'll post that when they're done. As you can see from the mad knittist 3x5" cards glowing brightly in undimmable contrast, that's a whopping inch and a half. So, another slow yarn day. And I have a whole new bag and then some of pretty, sparkly, fuzzy yarn, just begging for attention. So much yarn, so little time. Sigh. Note her little friend at her feet and the blood-stained blade. As usual, the paints and varnish are from Reaper and FolkArt. 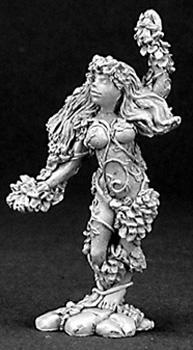 My version of the Dark Elf rather differs from the "standard" in that mine has light skin. Apparently the "standard" is to have dark skin and white hair, but I just can't help but disagree. They live underground, and most beings and critters that live underground and/or in the dark end up with pale skin. Also, they are related to High Elves, and would, in my opinion, have the same hair color range. 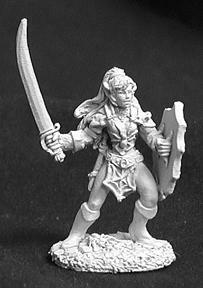 I've not actually played a Dark Elf, but my younger daughter has, and used this mini for that campaign. Fortunately, most of my minis can be carried over from the original D&D to Paizo's Pathfinder RPG, which is what we play now. Now on to the scarf. The base was made from a circle my Hubby cut from a plastic sheet he had which was then glued to the mini. I added Crayola Air-Dry Clay and sculpted additional rocks and the waves, using the only sculpting tools I had at the time: a yarn needle and a bobby pin. The paints and varnish are from Reaper and FolkArt. I figured that wasn't bad for a couple hours' work. Note the omnipresent mad knittist scribbles on the 3x5 cards. Nerdiness aside, I find that transferring the pattern to the cards helps me understand the pattern and look up any instructions I don't understand so it's easier to translate when I'm actually knitting it. That's especially helpful when the pattern includes an instruction that seems odd or out of place. 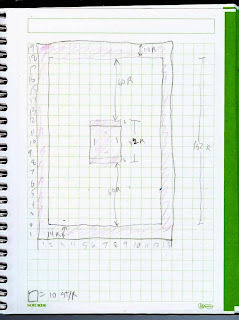 I have several types of index cards: graph cards for plotting the charts and regular lined cards for mad knittist notes. I also have blank ones, but I usually use those to roll up and put in the center of wound yarns. I'm one pattern repeat (4 rows) away from starting the decrease for the crown. 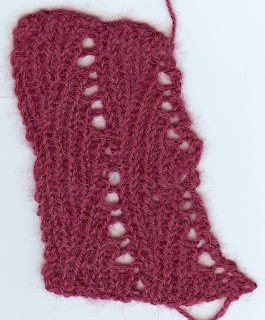 The cable pattern is really quite easy once the foundation row is done, so the scarf should go pretty quick too. Snow. In Texas. 'Nuff said. These were taken from my front and back doors, respectively, 2/12/2010. In case you don’t want to spend all day counting, that’s 13 sets of 7 polyhedral dice each (91 dice) plus a handful of mini 6-sided dice (for sneak attack damage). And no, that is not my entire dice collection, but a good portion of it. My Hubby calls this one "the Barbarian." They have “slow news days” in TV news, so maybe knitter bloggy people can have slow news days too. I've made some progress on a couple of projects but haven't finished anything, so this is that day. Thus, here’s a random pic of yarn. In a cauldron. On a hearth. Next to a giraffe-print pillow. I’ll leave explanations to the imagination. Argh matey, don’t ya be touchin’ me lucky charms. Or me cauldron o’yarn! 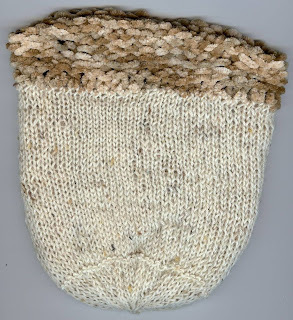 PS I nearly finished a dice bag and would have posted that, but I had to re-do the bottom of the liner. So what’s the holdup? As I’ve mentioned previously, I hate sewing knitting. This particular pattern, while I like it, is a pain to sew and it takes forever. Eventually, though, this UFO will join the ranks of the FO’s. Just, not today. P.S. It’s all Red Heart worsted weight yarns. For this set, I used two colors of Coats&Clark’s worsted weight Red Heart yarn. The main color is No. 0668 Honeydew (the name always makes me think of Dr. Bunsen Honeydew of the Muppets) and the contrasting color is No. 0318 Watercolor, which is a pretty multi, but used in very large pieces it can look oddly dark. I don’t normally use Red Heart for baby stuff, but it was the only yarn I could easily locate that included the color choices the mom-to-be gave me, and coordinates acceptably with the Winnie-the-Pooh theme she’s chosen for the baby. 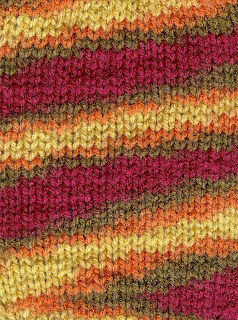 Once again, I scribbled some basic notes to create the thing, did the knitting and then wrote the pattern, which is available here. Yes, I’m backwards. Much like the backwards sails on the ship in the picture my older sis painted me years ago, I’m not wrong; I’m just backing out of the harbor. 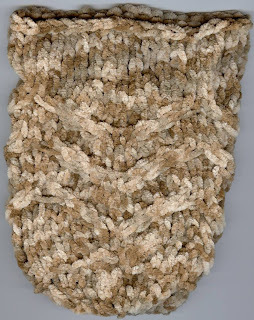 This is a variant on my standard generic sock pattern, much scaled down. 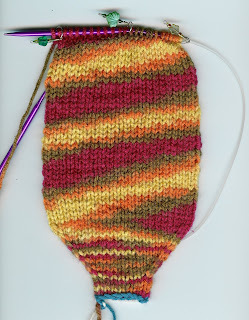 While I’ve taken to doing most socks using circular needles with the “magic loop” tactic, baby booties are rather small for that and work up very quickly, so I used DPN’s instead. 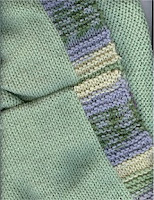 I also diverged from my normal practice of using a provisional cast-on and then the inside-out three needle bind-off. 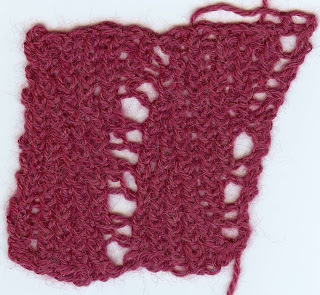 Instead, I started with two DPNs, alternating between the two as I cast on, i.e. stitches 1 & 3 on needle 1, stitches 2 & 4 on needle 2, using the single cast-on method. You can also use a figure 8 cast-on, but it will be a looser start, so if you’re doing the figure 8, you might want to use smaller needles for the cast-on and then change to the regular needles. 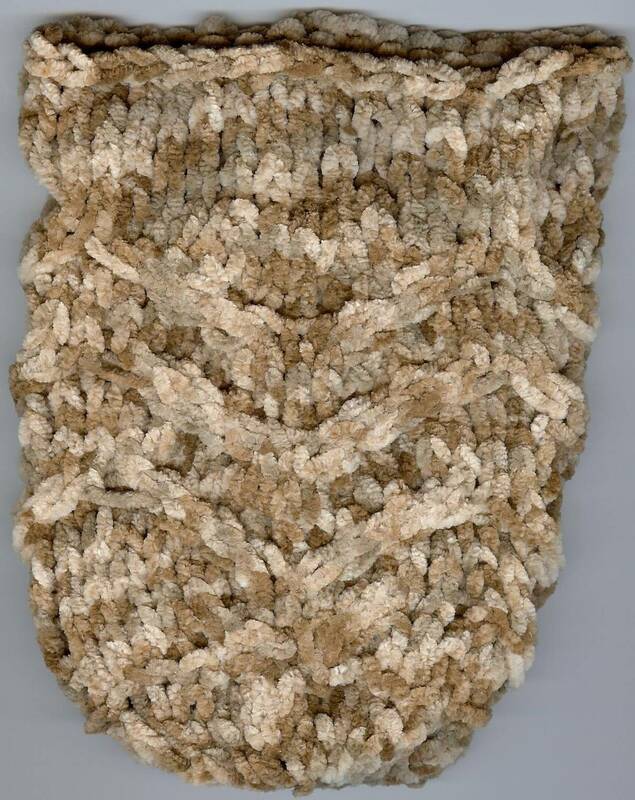 This is a rolled-brim baby hat. I like rolled brims for baby girls because it gives a softer edge and you can roll it up or down to adjust sizing. 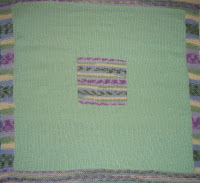 Again, due to the small size and quick workup, I used DPN’s for this, but feel free to use circular needles. Note the loop of excess yarn I’m going to have to tuck in. I’ve already tucked in the really big one. I don’t even know how that happens. 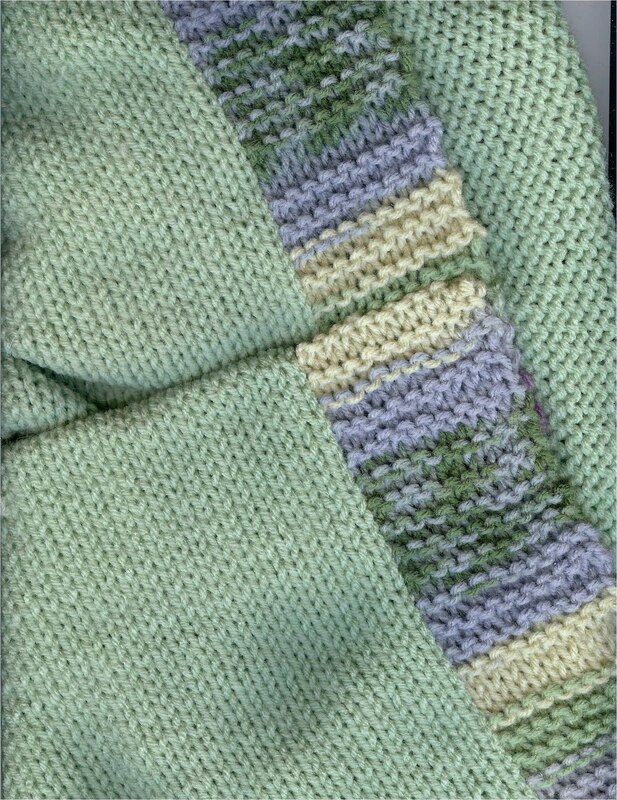 Note the areas where I forgot to rework the border stitches into garter stitch. 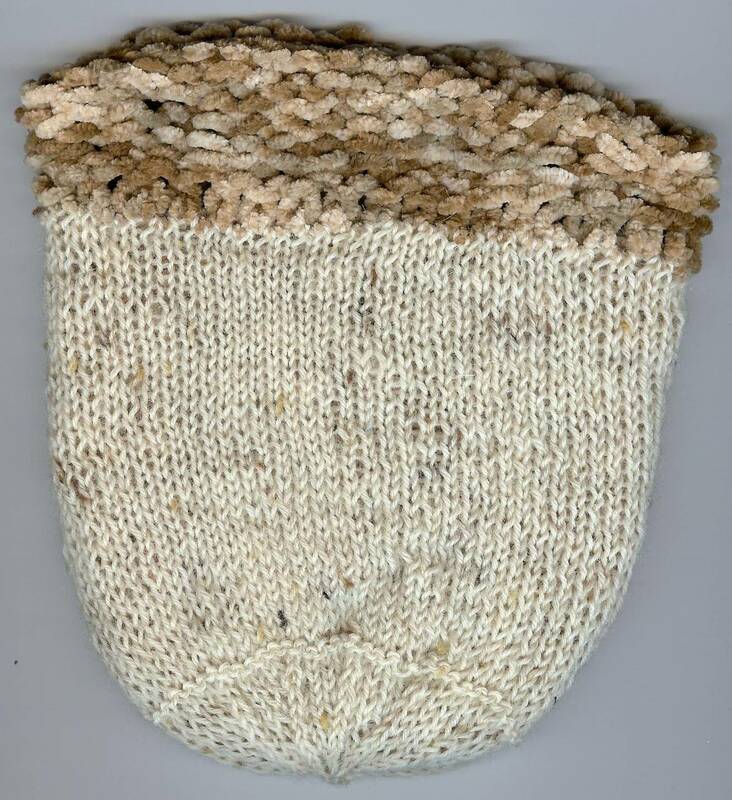 Vera works only in stockinette, so any other stitch has to be knitted, then reworked by hand. There are three places where I forgot to do this, all on the same side. 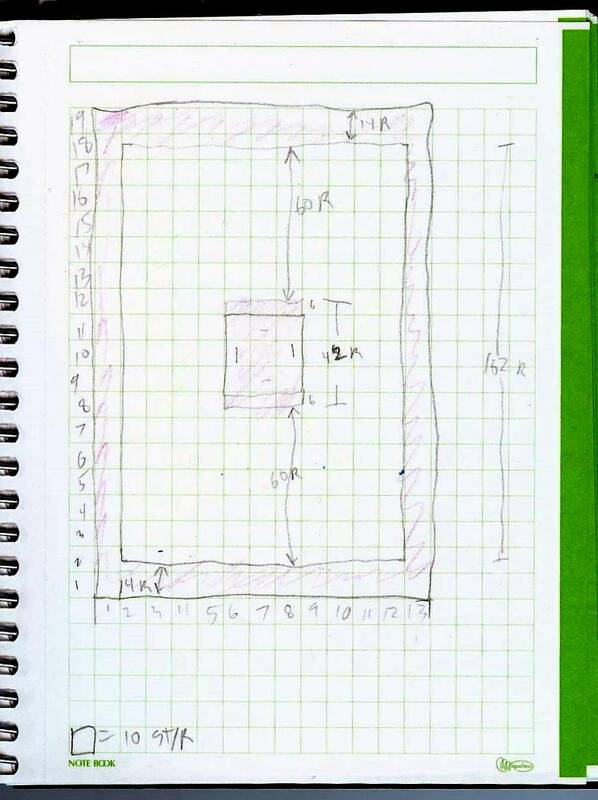 That is the plan/pattern for a baby blanket I just finished (note the lack of, well, notes). 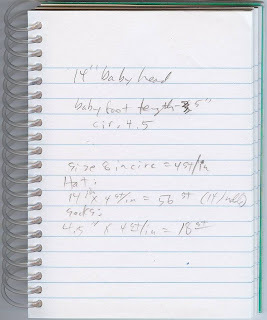 Those are my initial notes for the hat and booties. Note the lack of sketches. 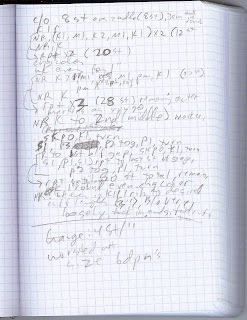 Also note that they’re in two separate notebooks. 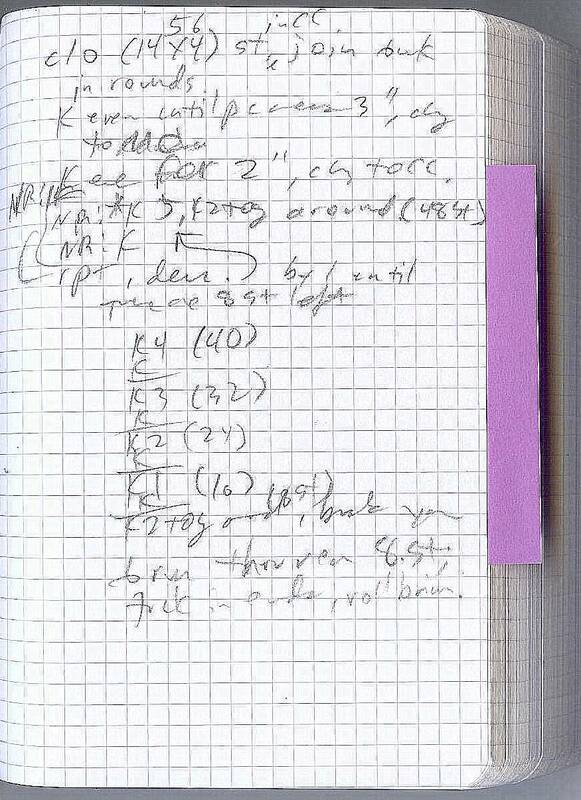 Now we’re up to three notebooks. My point is, if I could find something that had graph paper and note lines on the same page, this entire baby set could have been in one book. Wouldn’t that have been both convenient and slightly less mad scientist knittist? 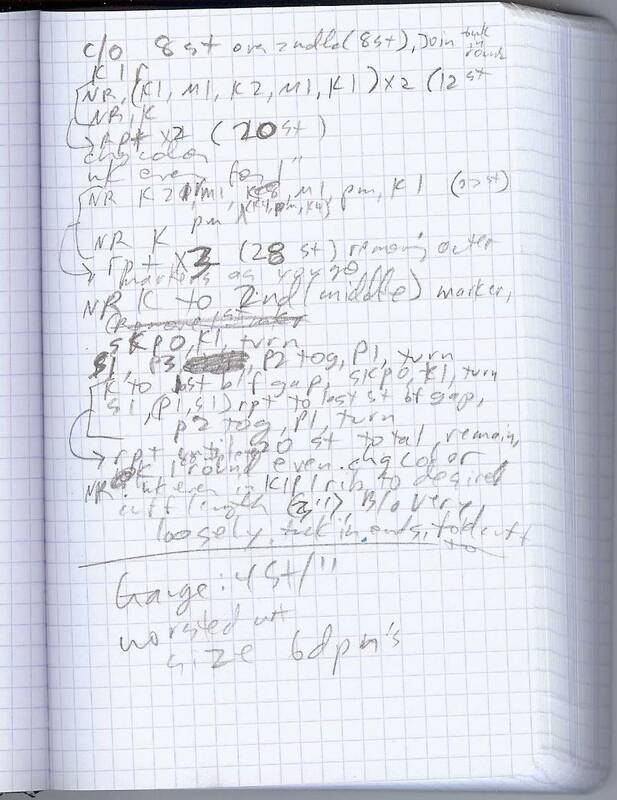 Oh sure, the writing might still remind one of a mad scientist scribbling frantically on a chalkboard, trying to complete a brand new equation that might change the universe as we know it, but at least there would be a little sketch nearby so you could tell it was just a baby bootie pattern. P.S. 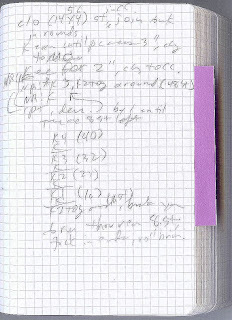 I plan to actually type these patterns up, thus the notes and reverse-engineering my own knitting.